Pittsburgh, PA — It’s entirely bad enough that heavily militarized police across the country are smashing down doors, nearly every minute of every day, in search of arbitrary substances deemed illegal by the state. However, the paramilitary apparatus which has sprung up in this modern day police state is deadly incompetent. Case after case we see SWAT teams kick down doors to homes, shoot dogs, throw grenades at babies, and even kill innocent people because they are at the wrong house, or acting on incorrect information. This gross deadly negligence is inflicted upon the citizenry with extreme prejudice, and unapologetically. The latest victims of incompetent police violence happen to live in Pittsburgh, PA.
Tabatha Werkmeister, Grinage Dion Wilson and their four young children, ages 2 through 9 were subject to violent militarized men kicking in their door in a predawn raid in January of last year. These armed men threw a smoke bomb into their home and forced the family, who was barefoot and in their pajamas, into the 20-degree snowy weather outside. 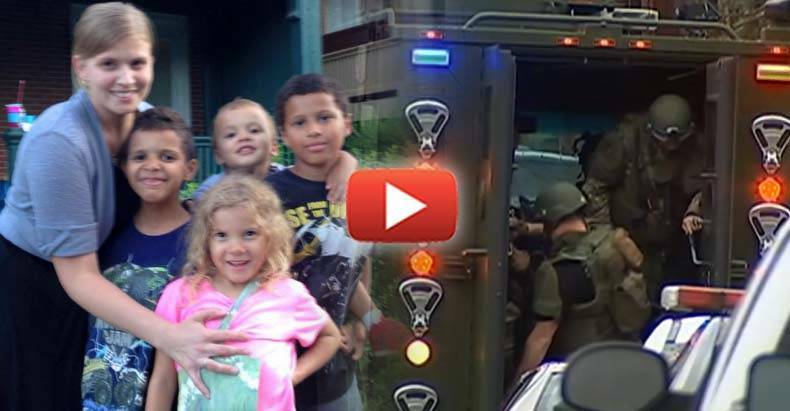 To provide them with a bit of police state comfort, they were forced into the back of an unheated SWAT vehicle for nearly an hour, according to a lawsuit filed on behalf of the family this week. “I was just totally stunned. I didn’t know what was going on, why they were there,” Werkmeister said. In addition to the city, the lawsuit targets then Police Chief Regina McDonald and 10 individual unnamed officers. After throwing four small children and their parents into the freezing cold, officers tore apart the family’s home, looking for non-existent contraband. Why was the contraband non-existent? The SWAT team basically flipped a coin over which door to kick in, and they chose the wrong one. During the interrogation of the family, they were asked if they knew “Marlo.” They did not. “Marlo” happened to live next door. Being that the SWAT team tore apart their home, terrorized this family, threatened the lives of their small children, all over being in the wrong house, they naturally paid for the damage and issued an apology, right? Wrong. According to the lawsuit, they did not apologize, and they told them to fix their own house. After the raid was over, the cops had the audacity to blame their ineptitude on the family by telling them it was their fault for not having the proper numbering on their door! So turn the rusty gears of the American police state.